BrisSynBio has access to the equipment and expertise housed in the Flow Cytometry Facility. This comprises high speed digital benchtop cytometers for analysis and a state of the art Fluorescence Activated Cell Sorter (FACS) for isolating populations of interest from a wide variety of cells or other particles. Aseptically sorted cells can be cultured for downstream studies or used for nucleic-acid profiling. From human cells to algae, bacteria and yeast, the flow cytometers provide analyses to identify and purify subsets of cells to study processes in the human body and in single-celled organisms. BD Influx high speed 16-parameter fluorescence activated cell sorter. 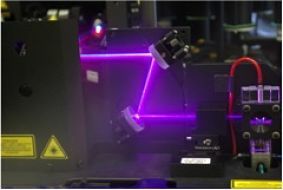 This contains 4 lasers and 16 optical parameters, allowing detection of multiple fluorescent reporters (e.g. CFP, GFP, mRFP, mCherry, tdTomato, mKate, mPlum). Construction and analysis of designed gene regulatory networks in bacteria. Construction and analysis of peptide-based nano-cages. The generation and analysis of membrane-bound nano-reactors. The Flow Cytometry Facility is located in Cellular and Molecular Medicine, in the Biomedical Sciences Building. Please contact Dr Andrew Herman for expert advice on experimental design and execution.